Towards the end of 2018, I decided that 2019 would be the year for at least three Christmas cards each month, in an effort to not have to rush making the last few in November. I plan to make some gift tags each month, too, so I’m hoping to keep it up and share Christmas projects all year. I’m starting with this one. I’ve made a card that is very me, clean and simple with a colored image and a cluster. I’ve colored up Got the Wreath with my trusty Copics in reds and grays. I’m not normally a fan of red, but I’m happy when I can make it a deep, brownish red and pair it with gray. That works in my world. Red and green, not so much. I had to color the wreath with greens, though, and I don’t think there’s too much of it, so it kind of works and the green doesn’t compete with the red for all the attention, which is sometimes an issue when using complementary colors. I diecut some scraps of Maja Design patterned paper from different Christmas collections and added them in a cluster in the top right corner. I’ve got Fröjdefull Jul, Home for the Holidays, and red monochromes from the Joyous Winterdays collection all in a neat little cluster, diecut with dies from Docrafts, Craft Emotions, and My Favorite Things. I white heat embossed a Norsk Stempelblad AS heart on one of the diecut pieces, and that’s my card for today. I’ll try to be better at including the colors I’ve used, so here they are. Hi, everyone! I hope you’re having a great Christmas. Today’s another Wednesday, the last one in 2018, in fact. I’ve got my last Christmas card for 2018 to share with you today, using Mo’s beautiful Sharing a Song image. I printed my image with a low opacity setting in Photoshop and did no line coloring with my Copics. I added chunky white embossing enamel for that wintery, snowy feel. The card itself is made by diecutting Maja Design patterned papers from last year’s Christmas collection, using a set of dies from GoKreate. 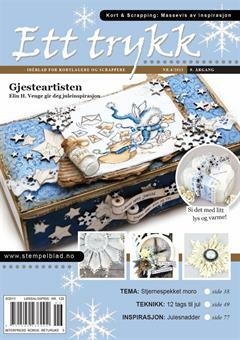 The sentiment from Norsk Stempeblad AS is heat embossed, and I added tiny little cones I’ve picked myself. The insde has the same patterned papers, another Norsk Stempelblad AS sentiment stamped in Papertrey Ink Enchanted Evening ink, as well as some heat embossed Huldra designstudio snowflakes, and a Crafty Moly veneer snowflake that I also heat embossed. I did the same thing for the back of the card. Sentiment, heat embossed snowflakes and veneer snowflakes for that extra little bit of dimension. Hi, everyone! I’ve got a clean and simple card to share with you today, featuring the adorable Mo Manning image Giggling Snowman. This card is actually published in the December issue of Ett trykk, and it even made the cover – yay! I made the cardbase with some Stamper’s Select White cardstock from Papertrey Ink. It’s my favorite white cardstock, nice and thick and bright white. I cut another panel of the same cardstock slightly smaller and diecut a window using a Hero Arts die. I ink blended my cardbase using three colors of blue dye ink; Papertrey Ink Spring Rain, and Stormy Sky and Faded Jeans Distress Ink from Ranger. I colored my snowman on X-Press It blending card using Copics (W4, W3, W1, W0, W00, C2, C1, C00, E000, B0000 for snow, B99, B97, B95, B93, B91 for the blue, and YR18, YR12, and Y35 for the carrot), before fussy cutting him and adding him to the left side of my diecut snowflake window. I ink blended a couple of strips of cardstock to make it match my blue background inside the circle. When the ink was dry I added a couple of Norsk Stempelblad AS sentiments and white heat embossed them. My last finishing touch is a few Kort & Godt diamonds and some Papirdesign crystals in the centers of the snowflakes.